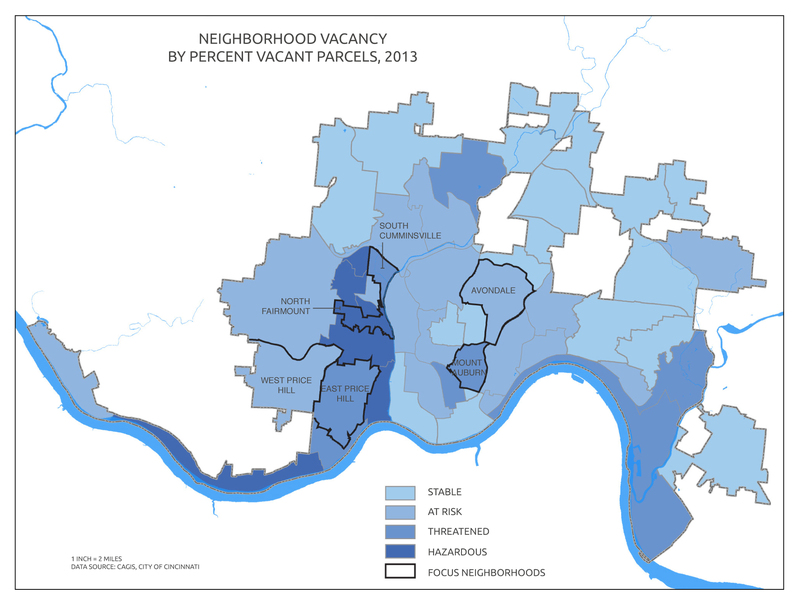 One of the most important steps in addressing vacant lots in Cincinnati is to understand vacancy rates in each of the city’s 52 neighborhoods. Vacancy rates can identify neighborhoods that are more heavily vacant than others and, therefore, should be a higher priority for cleaning up blighted vacant lots. Prioritizing high-concentration areas of vacancy for immediate action may help stabilize declining property values and prevent further neighborhood decay. If this logic proves true, effective planning must include the identification of strategic locations with high vacancy rates. In order to accurately map vacancy in Cincinnati, three sources of information were referenced: vacant land use, vacant buildings slated for demolition, and buildings ordered vacant by the city. Neighborhood vacancy was mapped by calculating the percentage of vacant parcels in each neighborhood. Neighborhood vacancy typologies were assigned four categories: STABLE, AT RISK, THREATENED, and HAZARDOUS. It should be noted that no focus neighborhoods fell under the stable category. The neighborhoods of Avondale and West Price Hill fall under AT RISK areas. East Price Hill, South Cumminsville, and Mt. Auburn are listed as THREATENED areas. North Fairmount fell under HAZARDOUS areas.